My elder daughter Katie had not visited the ASV so we travelled out during her summer break from university and spent a few days showing her the sights. 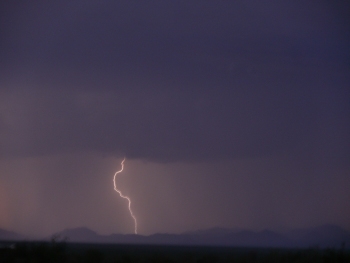 August is the time of the summer monsoon so we saw some dramatic thunderstorms but also enjoyed lots of sun and clear night skies. In the summer it is often cheaper to take a two-hop flight into Tucson rather than take the direct BA flight to Phoenix. 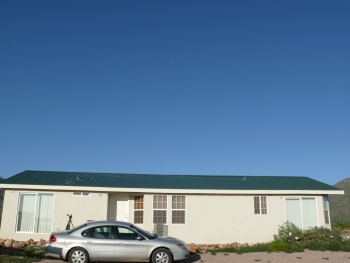 This proved to be the case in 2007 so we looked for alternatives, including flying into El Paso in New Mexico. I had never tried this route and as it was a similar price to Tucson this is what we decided to do. We flew via Dallas and arrived in El Paso in the early evening. I felt reasonably fresh so we picked up a hire car and drove straight to the ASV, stopping for a meal en route. We took highway I10 then highway 80 at Road Forks. As we drove down the San Simon Valley we could see regular flashes of lightning along the Chiricahuas on our right and the Peloncillos on our left. It was quite dramatic although we were in the dry. 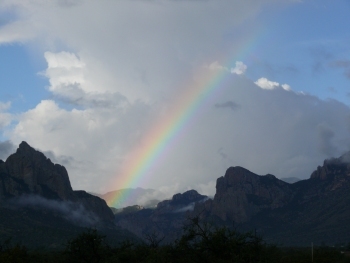 The next day we woke to more showers and a lovely rainbow starting in Cave Creek Canyon. One of the first places we visited was Bisbee, the old mining town filled with 'Victorian' houses. Before mechanisation allowed whole mountains to be processed in open-cast mines the miners used to follow a copper seam using traditional tunneling techniques. The largest of these mines was the Copper Queen and this is now open as a tourist attraction. A small train takes you deep underground and an ex miner then conducts a walking tour of some of the galleries. In the pictures he's explaining the function of this rail truck. Can you work out what it is? On the way home we called in at Douglas to stock up on groceries. Just like at home, there are some things you only get round to when you have a visitor. 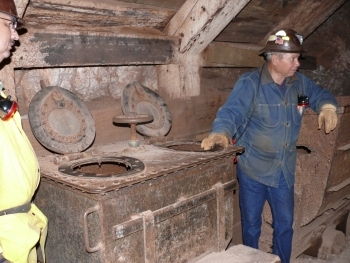 I had never been to the Copper Queen Mine or the Bisbee Mining Museum. After the mine trip we went to the museum which is excellent. It has been refurbished in recent years and though quite small it is fascinating with some well-designed exhibits. 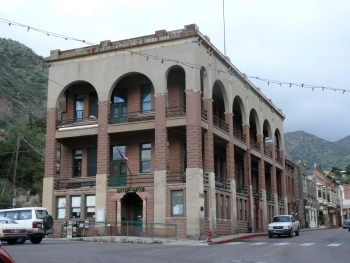 It's just across the road from the Post Office shown here as an example of some of the public buildings in Bisbee. 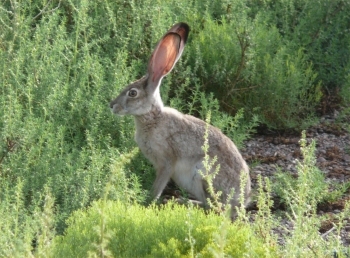 We gets lots of jack rabbits around the house. After the rains there's plenty for them to eat so this year they should have prospered. This one was almost tame enough to approach. I hope he was more wary of the coyotes. Our next visit was to Gil Clark and Mary Craig at their home on the Portal Road. 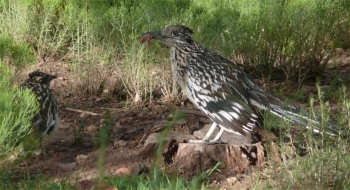 Mary's friendly road runner had a friend and in this picture it looks as though he's about to offer her a tasty morsel. The next day was beautiful; clear skies, not a breath of wind, ideal for flying, so I took Katie along to meet the Sky Gypsies. 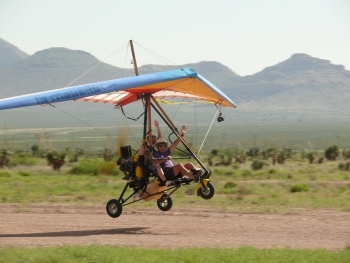 The picture shows her doing a low pass before heading off to explore the mountains and desert. She's in the back seat with the instructor on the control bar. While she was away I chatted with John McAfee who had just been demonstrating his flying skills for a visiting newspaper reporter. 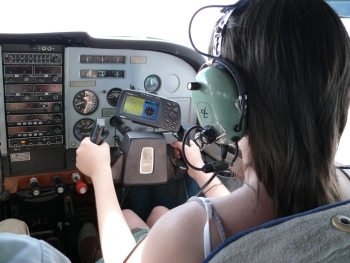 Katie loved her flight which had ended with the instructor taking her up to 10,000 feet and switching off the engine. They had then cruised around like a glider before returning to an engine-off landing, restarting the engine on the runway to taxi back to the hanger. Although his planes are state of the art John McAfee has a love of artefacts from the past. 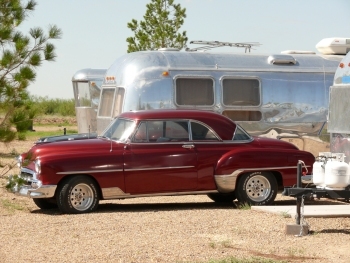 His fleet of Airstream Caravans, each with an immaculate vintage car, is now in use as accommodation for visitors and flying students. John also shows classic movies in his small theatre at the air park. For most of the year Cave Creek is dry where it crosses the desert and you have to go up into the canyon to see running water. 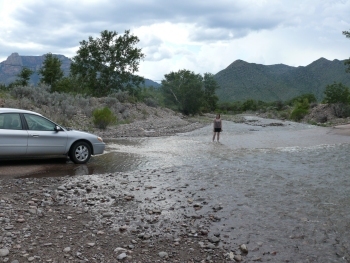 Because of the summer monsoon it was running alongside the sky village and Katie couldn't resist a paddle to cool off where it crosses the Foothills Road. At this time it was fordable but occasionally it is high enough to prevent ordinary cars driving through it. All this talk of rain may make you think that August is not a good time to visit the sky village. In fact, most days were bright and sunny with clear blue skies like the picture here. We did see some spectacular thunderstorms, usually in the distance but occasionally right above us, but these serve to clear the air and produce very transparent night skies. If you've read the earlier reports you will know I like to fly with Rick and Cleo at Rodeo Airport so I took Katie along to meet them. We hired Rick and his Cessna 307 for a tour of the mountains taking in Fort Bowie, Cochise Head, the Chiricahua National Monument and a final flight down Cave Creek Canyon and out over the sky village. Weather conditions were perfect. The good weather continued for the Perseids and we were invited to join Ray and Dori Brooks, together with a few neighbours, to watch from their deck. It was a perfect night and I have to admit that sitting in a deck chair in shirt sleeves, sipping a beer and counting shooting stars beats shivering on a cold winter's night in England. We didn't attempt any photography, just enjoyed the peace of the desert night in good company. Coyotes calling at night is one of those evocative sounds that bring back memories of cowboy films from my younger days. But occasionally we hear the distant sound of wolves which are not usually desert dwellers. They belong in the colder pine forests further north but there are several hundred living just over the border in New Mexico. I had heard of the Wolfsong Ranch on earlier visits but had never been to see it so Katie and I decided to investigate. 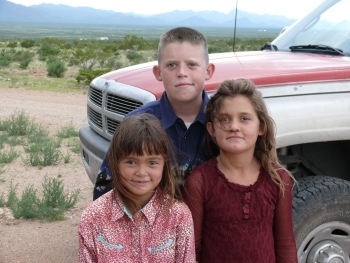 The Ranch is reached from the Animas Road and is approached via a dirt road that requires care in a conventional car. When we arrived it wasn't clear where to go; the gate was closed and there was no sign of visitor activity. A lady in a station wagon drove over to meet us and introduced herself as Jo. She said they weren't really open to visitors yet but if we'd care to return the following afternoon she would show us round. So the following day we returned for our tour which turned into the most remarkable experience. 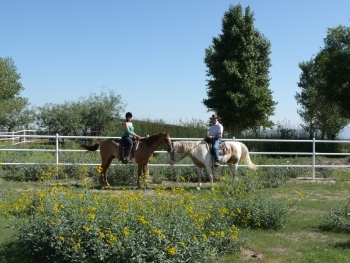 The ranch used to be owned by a breeder of wolves and wolf dogs. 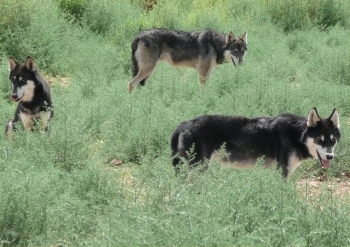 It is illegal to keep wolves without a licence and it's believed the previous owner ran the ranch as a sanctuary to enable him to breed wolf dogs for sale. When Jo and her husband took over the ranch they found the animals to be neglected and in very poor condition. 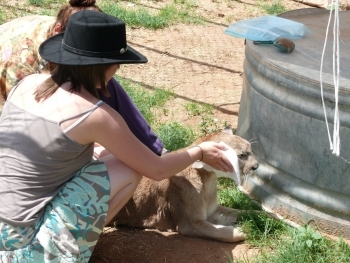 Much of Jo's time had been spent in renovating the enclosures and nursing the animals back to health. Jo drove us round the ranch and seemed to know every animal by name. She clearly loves them and her three children are treated as young cubs by some of the wolves. Individual packs are kept in separate enclosures and looked to be in good condition now. As we drove around, Jo told us she had a mountain lion and asked if we would like to see it. Of course we said yes, but we didn't realise just how close a look we would get. Jo went into the cage first and told us to follow her saying, 'Don't let her grab you.' We found ourselves inside the cage with the lioness and no idea how to avoid being grabbed by her. Our visit to Wolfsong Ranch had been fascating but there was yet another treat in store. I mentioned to Jo that I hadn't yet seen a Burrowing Owl. These make their nests underground and are known for bobbing their heads as though they are bowing politely. "We have lots on the ranch but I don't advertise the fact as I don't want them to be disturbed, but we can go and see them if you like" replied Jo. We saw several owls but didn't approach them too closely. They bobbed up and down by their burrows and ocasionally made short flights. A real treat for us. Jo had given us a couple of hours of her time then invited us in for coffee. Her great passion is for wildlife and conservation and she told us of the various campaigns and advisory bodies she works on. There are jaguars in the Peloncillo Mountains towards Mexico and these require protection if they are to survive. In particlular, the proposed border fence will restrict their movements as it will for many migratory animals. On the way out of the ranch we met Jo's three children who were walking home from the school bus. They were very polite and really nice. The youngest had grown up with the wolves, and had even been carried into one of the wolf's dens along with her other cubs for protection. 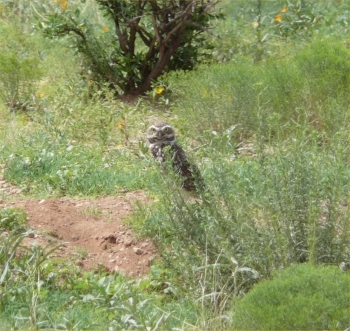 After leaving the Wolfsong Ranch we climbed one of the foothills of the Peloncillos in search of more owls. John Kemmeries, who invented the powered kite wing and is one of the Sky Gypsy founders, told me of a cave where they had come across three large white owls roosting. We wanted to see if we could find them so followed what we could remember of his directions. Despite not being suitably dressed we climbed up to a cave which may have been the right one, but didn't find any owls. Still it was interesting to see what had once been a small mine and the views were excellent. That night the sky grew dark and there were several thunder storms around us. The photo shows one away to the north in the direction of San Simon. I find it fascinating to watch these self-contained storms move along. 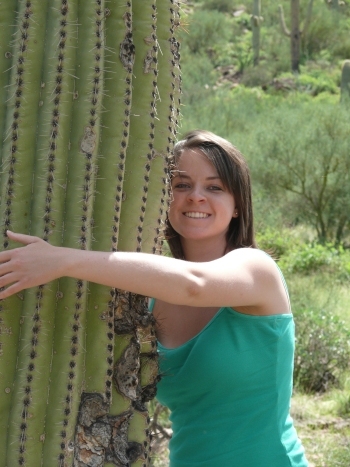 How do you hug a cactus? The answer is: very carefully of course. I took Katie to one of my favourite places near Tucson, the Desert Museum, which I hadn't visited for many years. It's a wonderful place to see many of the desert animals, birds, insects and plants and to learn about them. On the way we passed through acres of Saguaro Cacti, some of which are massive. They really do look like the cacti from Peanuts cartoons but grow in a relatively restricted area around Tucson. The walk-in aviary is one of the museum's main features. It's in the open air but enclosed by fine-mesh netting. Large enough to make you feel you are in the natural desert but small enough to make it easy to see the birds which are quite used to human company. I especially like the way the humming birds come so close, although they can be encouraged to come as close as this in the wild if you have the patience. Black bears, mountain lions, bob-cats, tarantulas, scorpions, snakes and many other animals are on display with guides (called docents) to answer your questions. 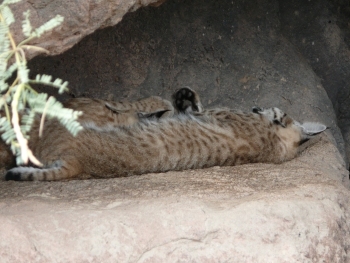 I thoroughly recommend the Desert Museum as a great introduction to all aspects of the desert. Back at the sky village Ray Brooks offered to take Katie for a ride in the mountains on his motorbike and she jumped at the chance. Here they are setting off, dressed in a way that would be illegal in the UK. When they returned Katie had decided she wants a motorbike so she must have enjoyed it. 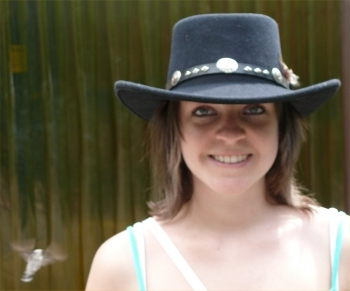 I had to give Katie a taste of the old west so we headed for Tombstone to take in a gun fight or two. After lunch at Big Nose Kate's Saloon Katie posed for this photo using some of the saloon's props. 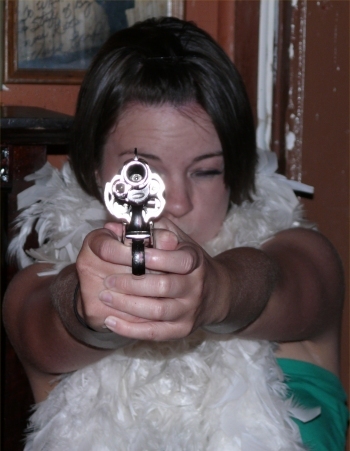 I don't know if her other eye was closed as well but she seemed to have the gun pointing straight at the camera. Katie isn't particularly comfortable on a horse but I wanted her to try western style as it's eaiser than english. Chris Wilbur supplied us with a couple of horses and the picture shows us in the paddock getting ready to go. We restricted ourselves to a gentle amble around the lanes then returned to the house to meet the other animals. 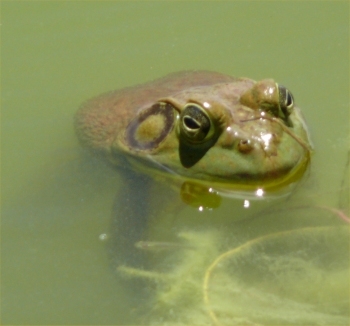 Chris and Bill Wilbur have a pond that is full of water all year round but wild animals are more active around it in the rainy season when evolution has taught them to expect water. There were lots of different dragonflies and bullforgs. This one posed very obligingly at my feet. Katie and I packed a lot into a short visit but soon it was time to return home. We drove back to El Paso along highway 9 which runs parallel and to the south of I10. It cuts quite a bit off the journey and you can drive almost as fast as on I10. But watch out for the few bends that appear from nowhere just when you've got used to it being straight for mile after mile. It was a most enjoyable trip for me and hopefully an unforgettable experience for Katie. Because she is away at university we don't get to spend much time together so this trip was extra special. I thought I'd include this picture as the last one in the report. 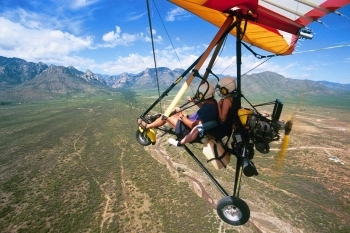 It was taken by a wing-mounted camera and shows Katie over Cave Creek with the Chiricahuas and Cave Creek Canyon in the background. Behind the ultralight you can just see our house on the edge of the sky village.